Budget reaction: Tory Majority odds cut. As soon as the Chancellor stood up on Wednesday, we started seeing a lot of money on the Tories, in particular on them gaining a majority. Several four figure bets forced the price in from 5/1 to 9/2. We also had a shop customer in Wiltshire turn up with £4,500 in cash this morning to back Tory most seats at 4/9. Normally, one might expect a budget to produce a short term polling boost for the governing party. I don’t think this budget was really dramatic enough to create a very big effect, but I wouldn’t be surprised to see a few modest Tory leads in this weekend’s polls. Then, as some of the attack lines get traction and people just forget, the polls will revert back to something close to the previous position. If the net effect were to leave the Tories a point or two better off than before, that would be great news for the Chancellor. My guess would be that it won’t make that much difference. In one sense, that would be very positive for Labour; the clock keeps ticking down and, if the polls stay in roughly the same area, Ed Miliband can feel increasingly confident about becoming Prime Minister. 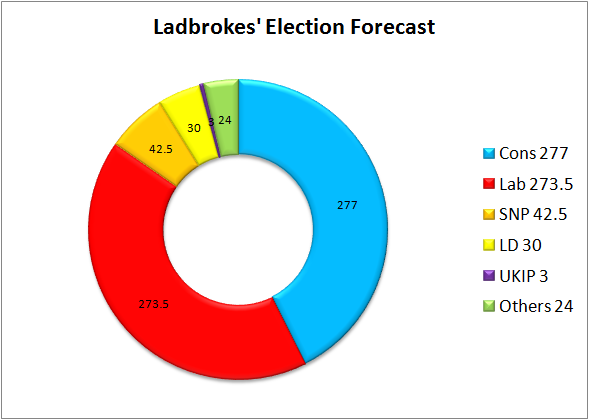 I’m still of the opinion that the betting markets are over-estimating the prospects of a Conservative victory. 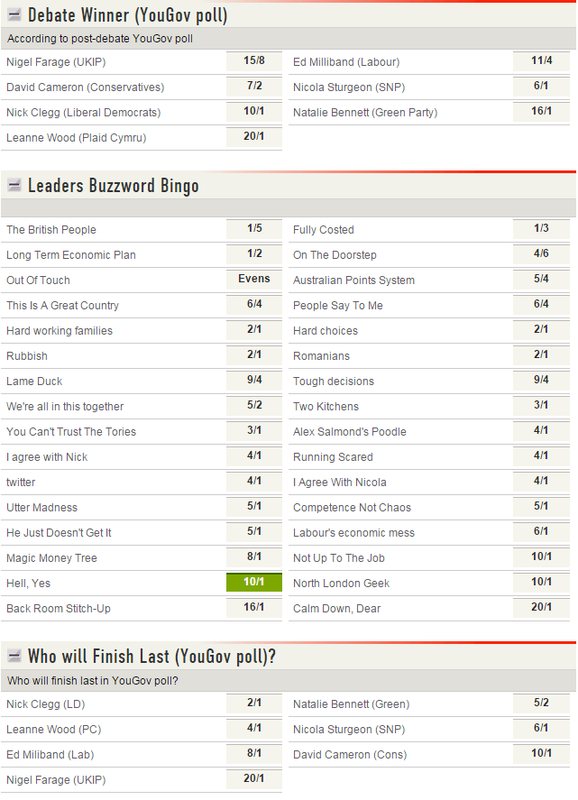 You can find all of the latest election betting here. Well, we dodged a bullet with “Hard Working Families” (Osborne went the more inclusive “Hard Working People”) but the Chancellor couldn’t resist putting in a “Two Kitchens” gag. That was a 10/1 shot when we opened up the betting, was backed into 5/1, and cost us enough to pay for a few ancillary kitchenettes. 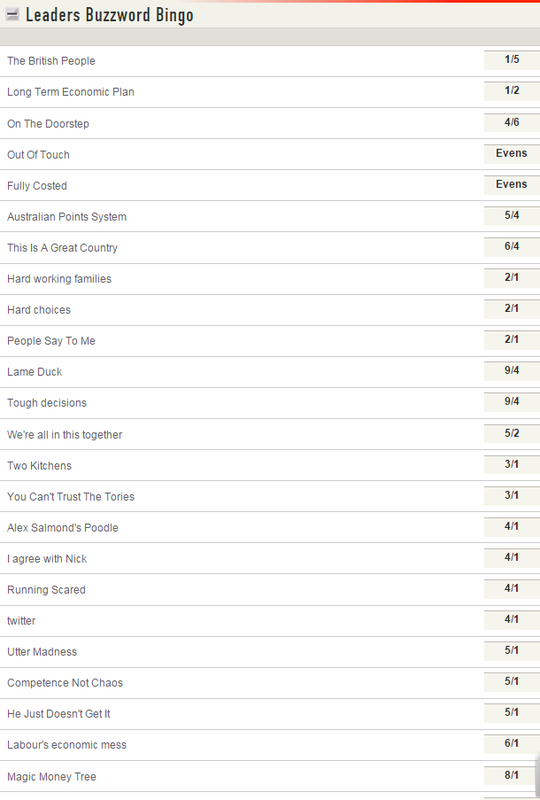 On the bright side, we only took a couple of bets on a Grey tie (6/1) as the gamble on Blue (Evs) was thwarted. The speech went over the 55min line, which was a small loser for Ladbrokes. 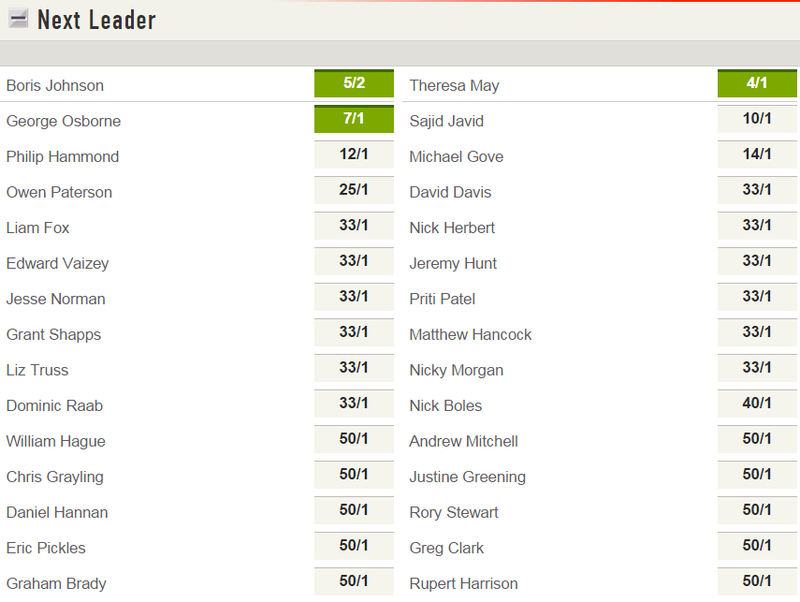 We make it a shade of odds on that Osborne doesn’t deliver the 2016 Budget. Even if the Tories are still in government, there is a lot of talk that he might prefer to get out of the Treasury, possibly to the Foreign Office instead.